As the name suggests, this is the ideal Aruba dining! Barefoot is the perfect spot for an exquisite dinner in a tropical ambiance: great food, friendly, professional service, a gentle tropical breeze, the ocean in the background, and soft white sand for your feet… Located across from Talk of the Town, near the airport, Barefoot has tables right on the beach and under a large palapa. 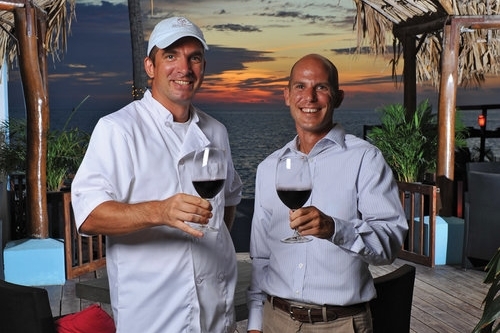 Gerco, Luc and the Barefoot team are looking forward to welcoming you for a fabulous evening, in flip-flops. More than just dinner, your evening at Barefoot will be an Aruba experience you’ll fondly remember for a long time! lasagna of zucchini, mozzarella and Parmigiano-Reggiano, served in a marinara sauce with basil… buon appetito! tiramisu made with banana instead of coffee, fabulous!